Argonne engineers found that ethanol-fueled engines can go just as fast as traditional racecar engines with environmentally unfriendly leaded fuel. Photo credit: Darryl Moran / Creative Commons. 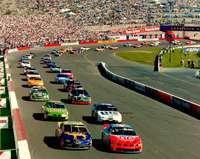 (PhysOrg.com) -- A group of automotive researchers from the Argonne National Laboratory and industry have shown that a fuel-injected racing car engine fueled by E-85, an ethanol-based fuel, outperforms the same engine with a carburetor and leaded racing fuel. "The testing disproves two widely and firmly held beliefs in the circle track racing community - that carbureted engines are inherently more powerful than engines equipped with a fuel injection system; and that E-85, which is less expensive than leaded racing fuel, is not well-suited as a fuel for race cars," said Jehlik, who leads the benchmark testing for Project Green. The brake specific guel consumption is still a lot higher... you'd have to pit the car much more often. Even if all cars are forced to make the change at the same time it would still require strategy changes. here in Brazil, where over half the fleet used ethanol only in the 80s and nowadays some 90% of the fleet has flex-fuel engines (run on any mix of gas and ethanol), anybody knows in practical everyday life terms that your car HAS A BOOST with ethanol... it DOES get more powerful, gets faster. But it consumes more fuel. does anybody still has to make experiments to prove something everybody already knows? My sad experience with fuel injection on the race track is electronic malfunction. I lost nearly all power because of failure of a tiny part, which we couldn't diagnose until we got the car back to the shop on Monday. Carburetors are much simpler, and any minor malfunction can be diagnosed and fixed at the track within five minutes. A successful race car needs to be as reliable and fixable as possible. Even if fuel injection is theoretically a little more efficient, it is a bad bet under the high-stress, high-stakes environment of the race. Hopefully, fuel injection will continue to become more reliable and efficient, because eventually it will be mandatory. This isn't new. Ethanol has a higher octane rating. The problem with repair is familiarity and tools to diagnose and fix the system. A good electronic system will be more trouble free than a carburetor. But it's different, so you need to learn a new bag of tricks to make it work really well. Formula 1, among others has used electronically controlled fuel injection for years and years. A decent electronic system is able to diagnose itself in most cases, much like a production car and tell you what might need to be replaced or even what wire has a problem. Multi-point electronically controlled injection will always work better overall and more consistently than any carb., especially where there is heavy vibration or acceleration forces on the engine such as an off road or racing application. 2) no issues with wet fuel flow vs. air flow in the manifold to each individual cyl. This eliminates cyl. to cyl. fuel mal-distribution so each cylinder can work at its potential. 3) not having to worry about wet fuel flow in the manifold allows freedom to design the air intake manifold to be tuned for an application, more analogous to an exhaust header. E85 is higher octane so allows for higher compression ratio and works great with boosted engines. What's Argonne doing wasting their time with a NASCAR circle track car anyway? Seems they've wasted their time, this is a 'known quantity'. A class of racing in Australia (V8 Supercars) has been using E85 for the past 18 months or so. No news here. Both E-85 especially with a higher compression it can handle makes more power and FI is a no brainer. The thing about needing more is it costs a lot less then even gas, not to mention racing gas, and you can just do a larger gas tank. Most roundy-round racing isn't that long where a stock tank won't last the full race. Nor does Ethanol reduce food supplies because not only do you get ethanol but corn oil and dried mash which is a much higher quality animal or human food than the yellow cord is which isn't eaten by humans, just animals. We eat white corn.